But that was not to be as there were not so happy tidings down here in my home state over the festive season. 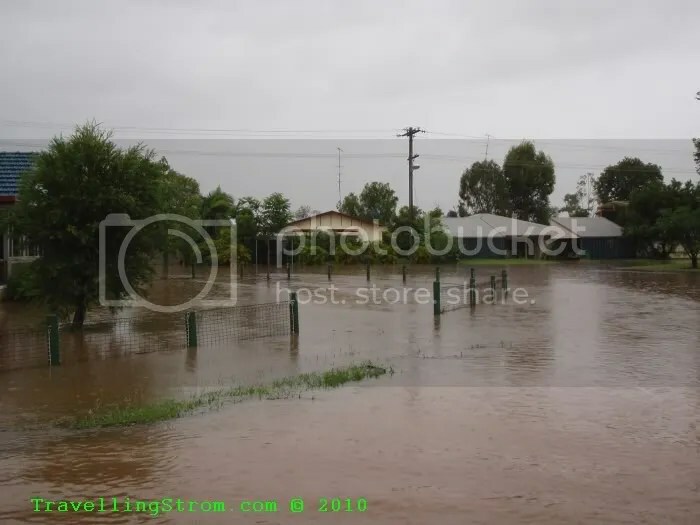 We have had massive amounts of rain over the past month or so and the ground is waterlogged. 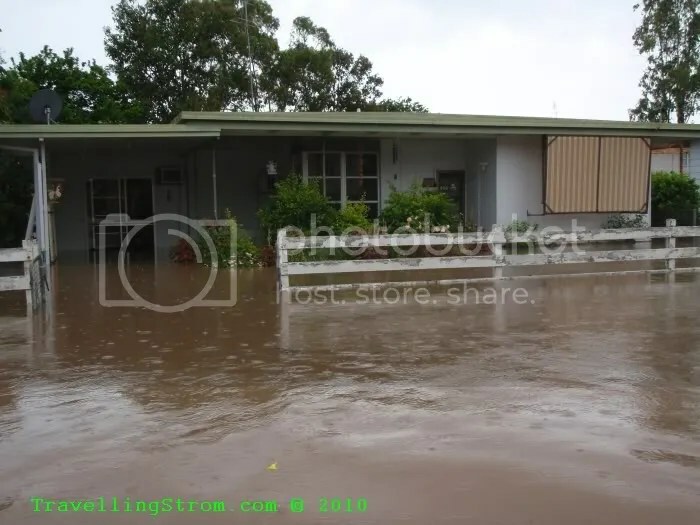 With the extra rain and a mini cyclone just before xmas in our rivers catchment area(The Fitzroy River), we are in for a major flood event which is still happening as this is posted on a rare day off. 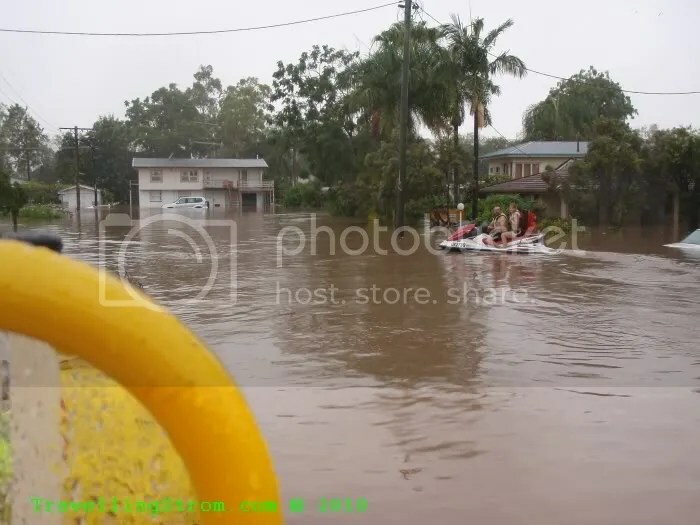 I will try and give you some idea of what is happening down here, especially to those family and friends of mine overseas and here in Oz who may or may nor have heard. 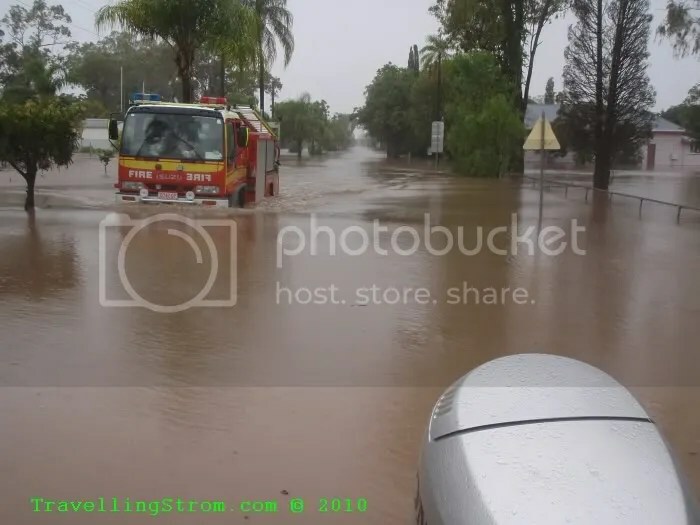 As a member of our local SES (State Emergency Service) which is a voluntary organization I have been busy for a long while with localised flooding and storm damage and I was even called out on Xmas day to help a chap who turned out to be the duty manager of my local pub!! 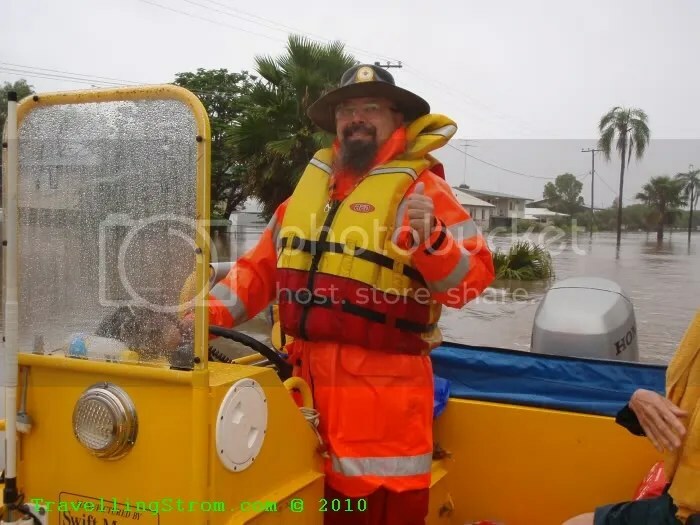 It has been a very busy time for all of our local team, but as I was qualified with a flood boat coxwains ticket(and willing to go), I was deployed on Boxing Day with another fellow Vstrom rider and of course boat coxwain, to a small town called Theodore 2 hours south west of Rockhampton to help relieve the local SES crew who had been flat out for many days preparing for a flood in their town. 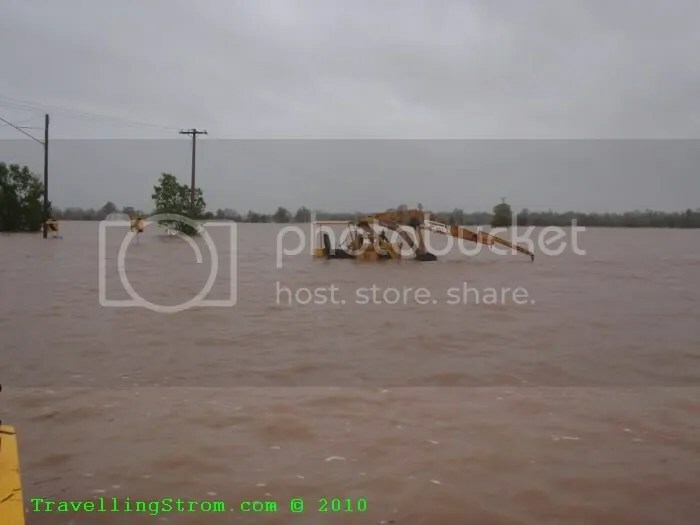 All the water they were receiving would eventually arrive in Rocky, but not for another week or so, but our time here would be limited as we would most likely be needed back home soon to deal with our own flood event. 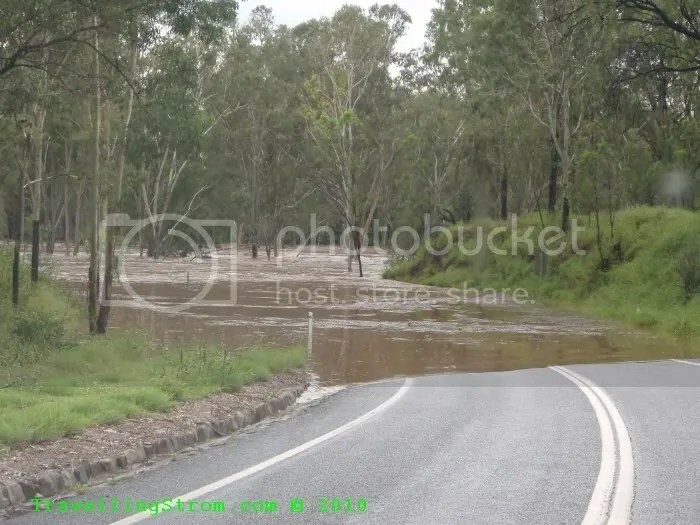 So, on Sunday morning we headed west and spent a fruitless 5 hours trying to navigate around the county side by 4WD to actually get to the town, but were blocked on both routes by swollen rivers or fast flowing water over flooded crossings!!! After returning to base we were then instructed to get weighed and we were then dispatched to the airport and a chopper ride and it was not a Harley either 😉 . A slight hiccup as the chopper pilot did not have the right card for the fuel bowser, so my partner used his plastic to fuel up and we finally headed out late afternoon. 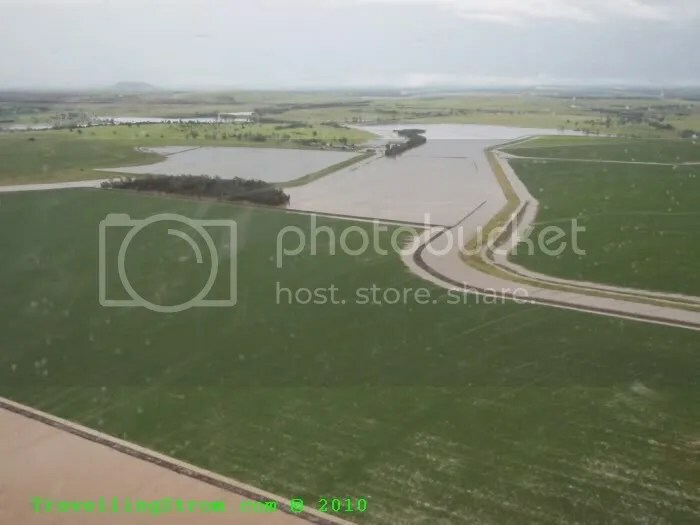 The land was saturated and from the air this was very evident with most of the usually dry creeks overflowing and filling the farmers fields and paddocks and turning them into mini lakes, a very depressing sight. 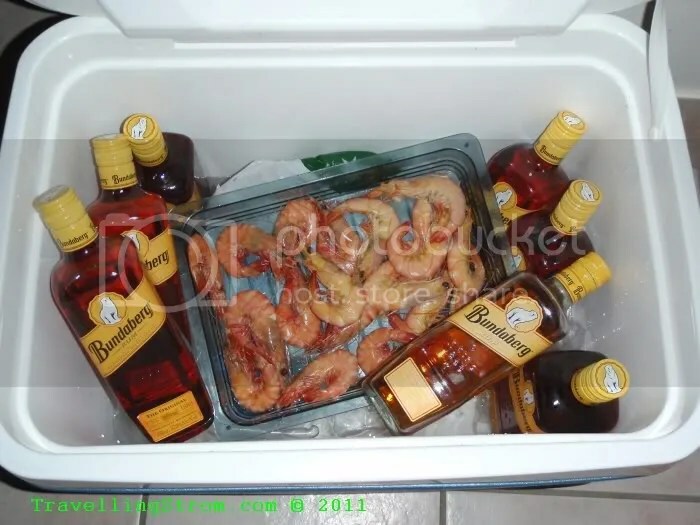 We were up before sparrow fart, had some brekky and headed down for a Local Disaster Management Committee meeting, where we were tasked with that days work. 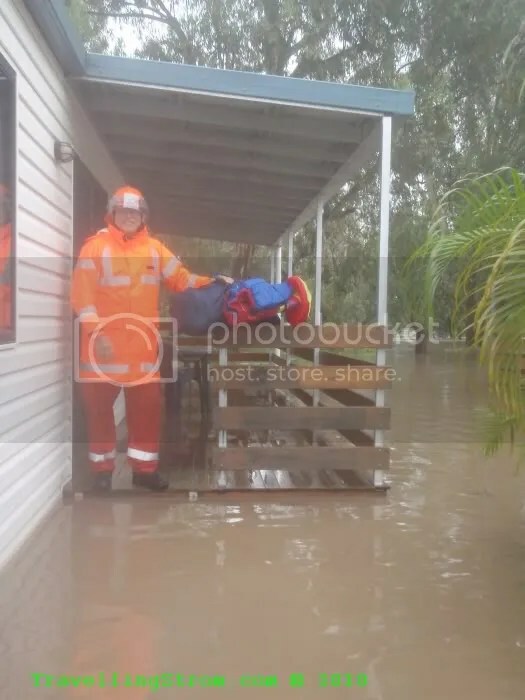 Basically send all local SES people home, man the HQ, deal with all incoming calls from residents, hand out sandbags and start evacuating some people out in the outlying areas of town. 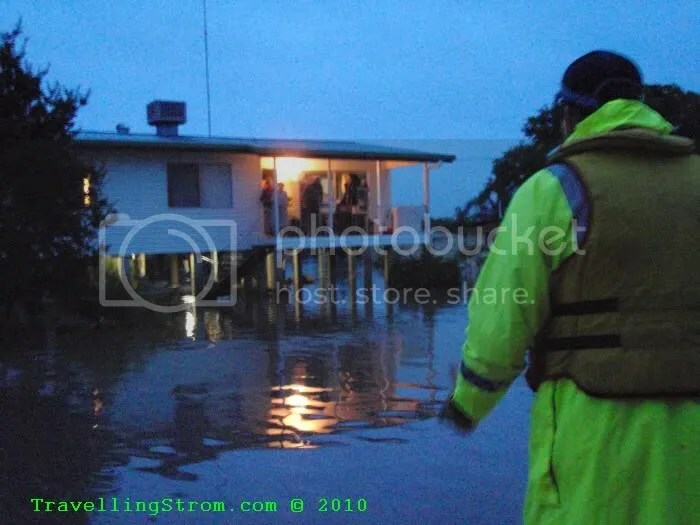 One of the main tasks was to update the BOM site with river height readings and as the gauge was outside the HQ side door, this was an easy task to be done every half hour and a direct computer link to input data, the trend was RISING slowly, but surely. 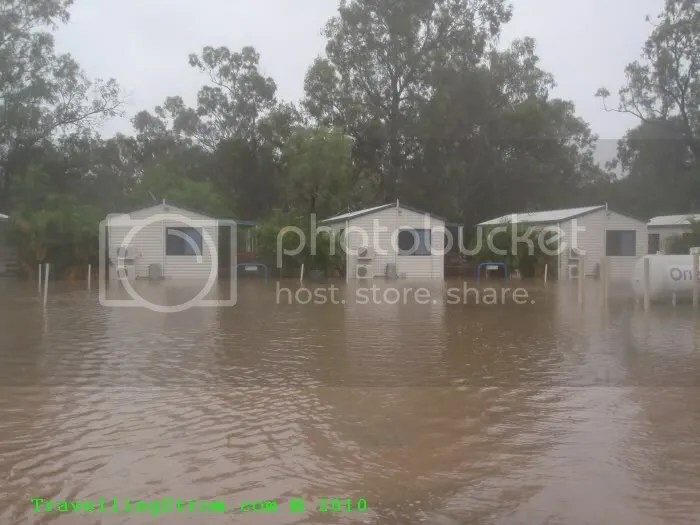 The one that effects us is the Dawson River at Theodore. 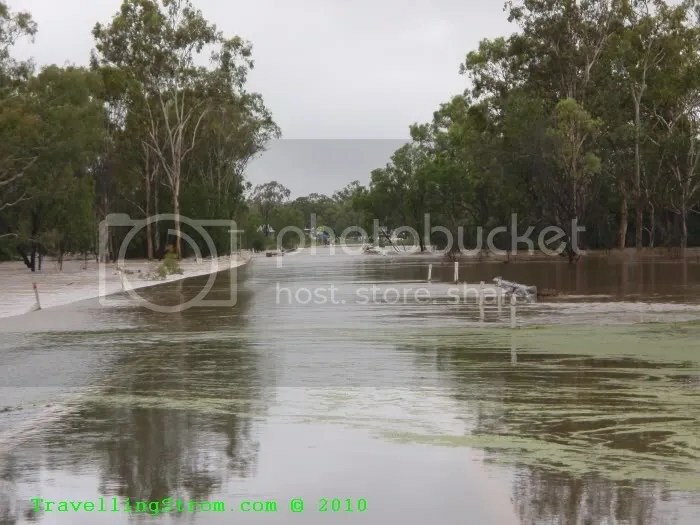 While we were there, the river kept on rising and its peak was 14.67m a new record, so as you can see, it had a ways to go yet. If you look at the rivers plot over a number of days(this is on the 3rd Jan) you can see on the 27th there were many readings taken(lots of blue dots close together), then the river got to high and the HQ was shut down with a foot of water through it and the occasional reading was phoned through. 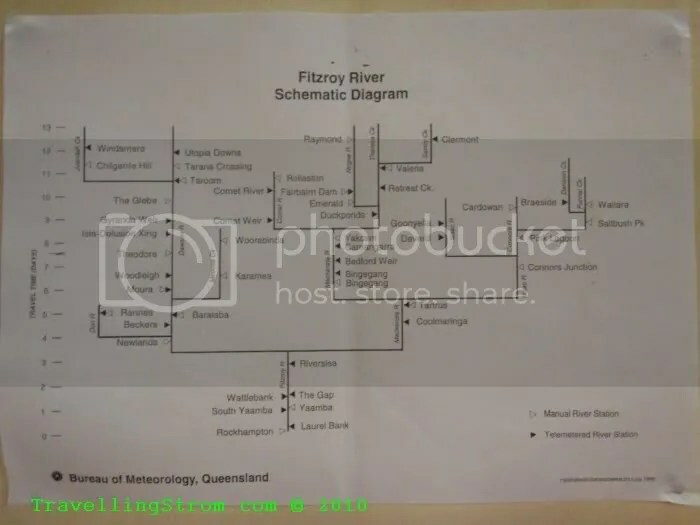 This next picture is of great interest as it shows the Fitzroy river catchment, one of the largest in Australia. 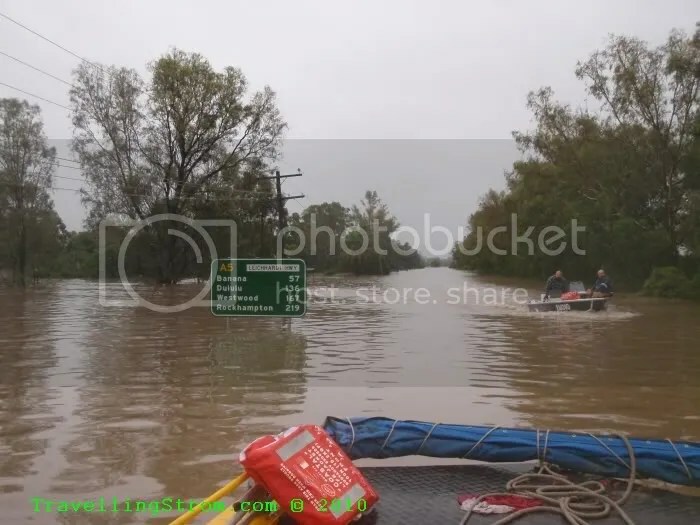 Looking at the picture, Rocky is at the bottom, the last town before the sea and the town of Theodore is to the left and up halfway. 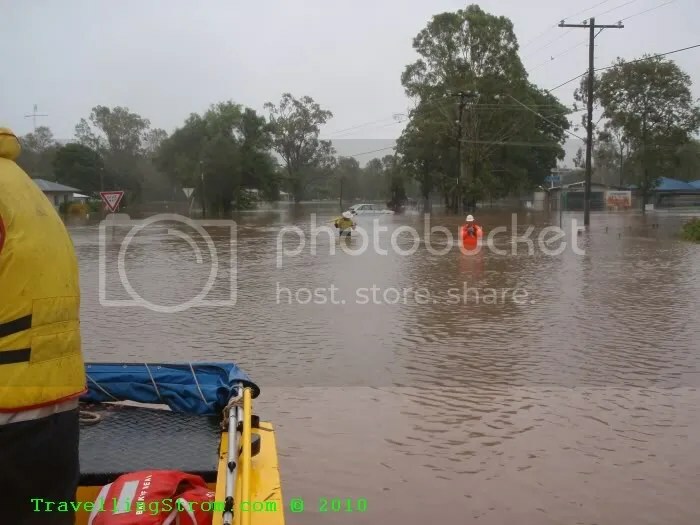 This is basically west of Rocky and South, the other side is the west and northern rivers that also flow through our town. 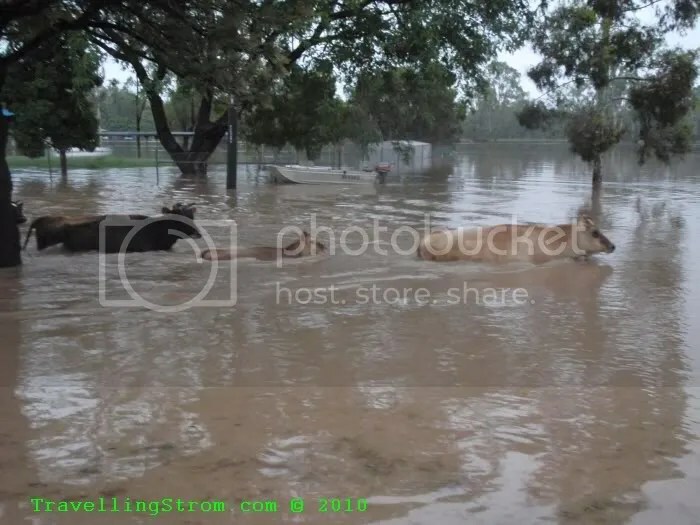 The town of Taroom (upstream a bit from Theodore) copped the rain after us and that water arrived in Theodore 5 days later after the water levels had fallen, this brought them to a new peak of 14.79m, another new record for this devastated town! 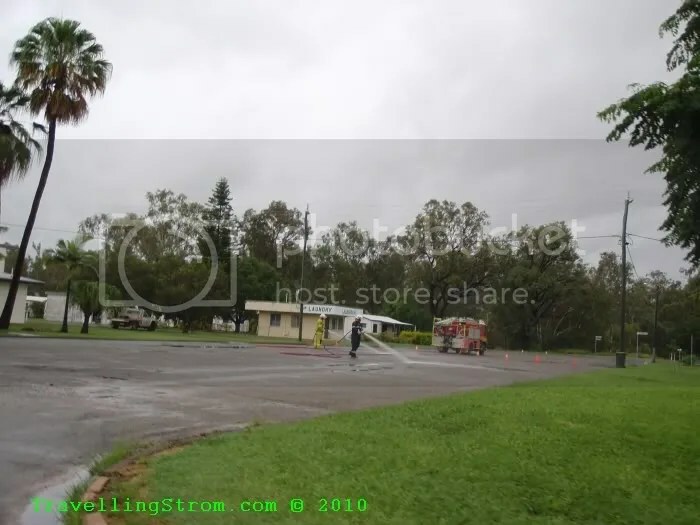 This next shot is the roadway next to the pub, it is being cleared for a helipad in case it is needed. 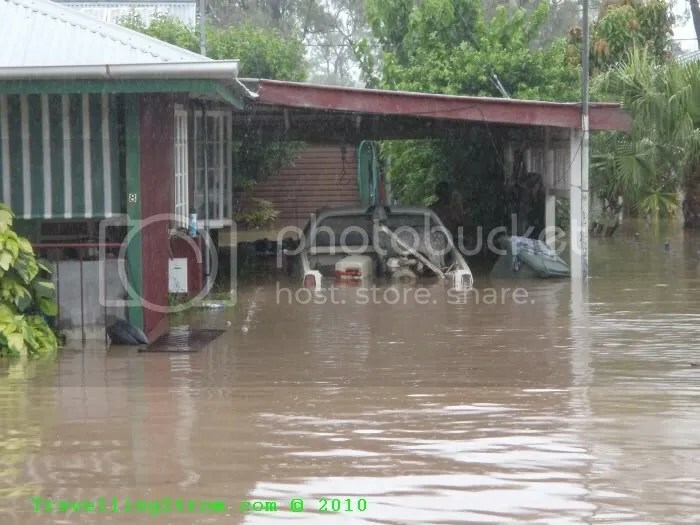 So, after a long day, we were relieved and we managed to get to the pub for a meal and had another early night with the water moving steadily up towards our cabin, talk about river views!!! 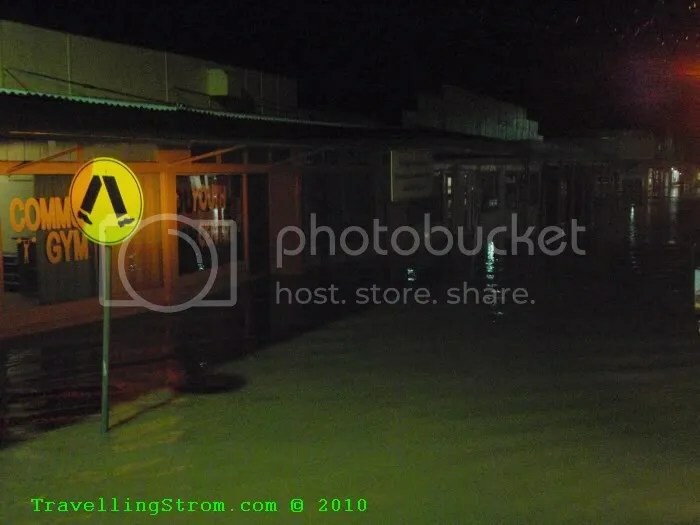 Well, so much for a nice sleep, we were woken at 1.30 am by our local SES boss, the water had risen to 14.2m, this was the trigger to evacuate the local hospital and move things to higher ground if possible, so, groggy with lack of sleep we headed off into the rain and then waded up to our knees and did the job that was required. 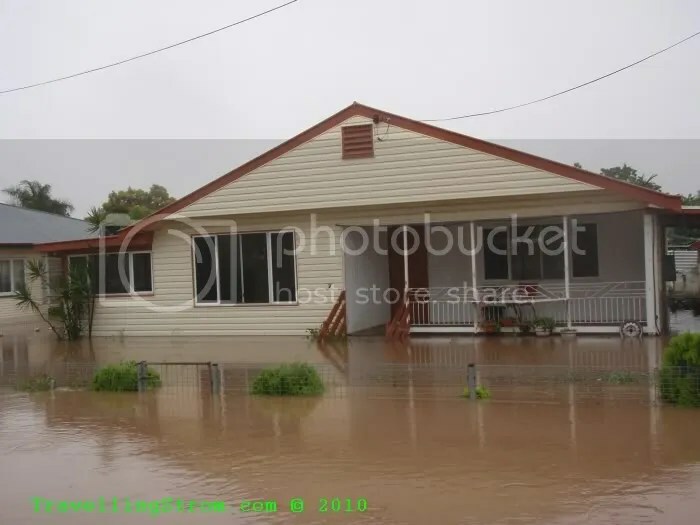 The water had risen into the main street and was also starting to affect local businesses. 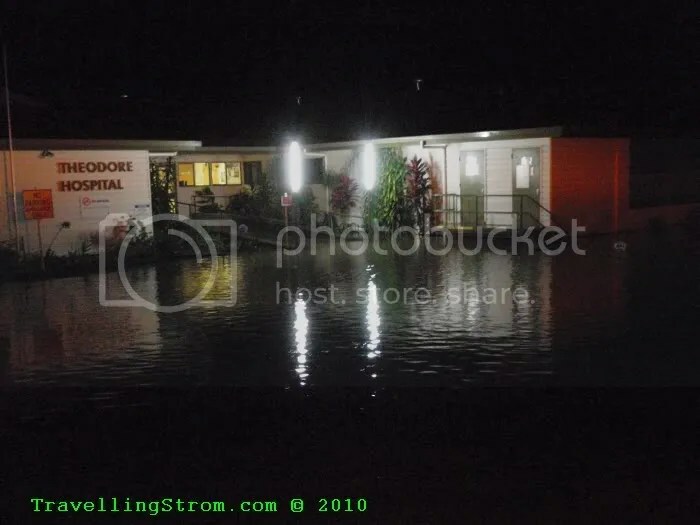 Around about dawn we were asked by the police to take them in the boat to start forced evacuations, mainly of those with medical problems or the elderly, because the town was now without a hospital and the doctors surgery was underwater as well. 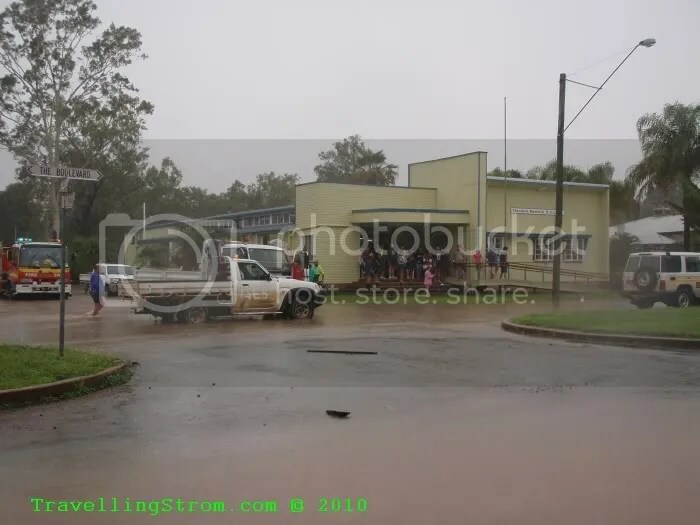 So, my turn to navigate down the local streets, and bring people out and at one stage it looked like I was going to need a bullbar on the front of the boat as a loose mob was looking for sanctuary!!! 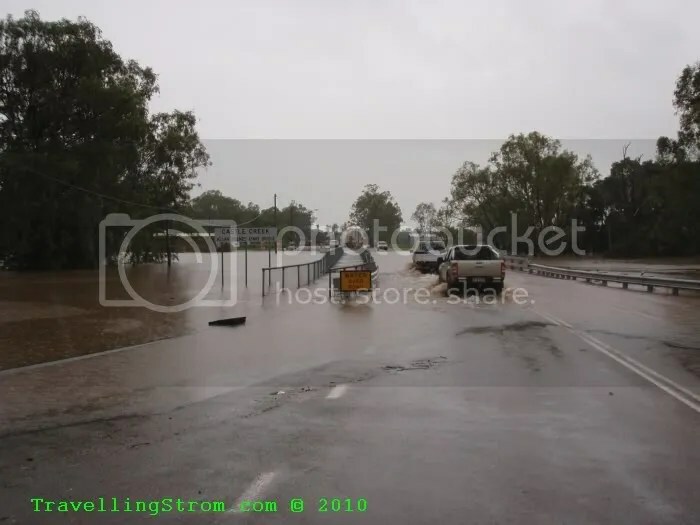 Then a long ride out along the main road to Rocky to take out an elderly lady on the other side of the water, most of those along this road were taken out yesterday by my partner. 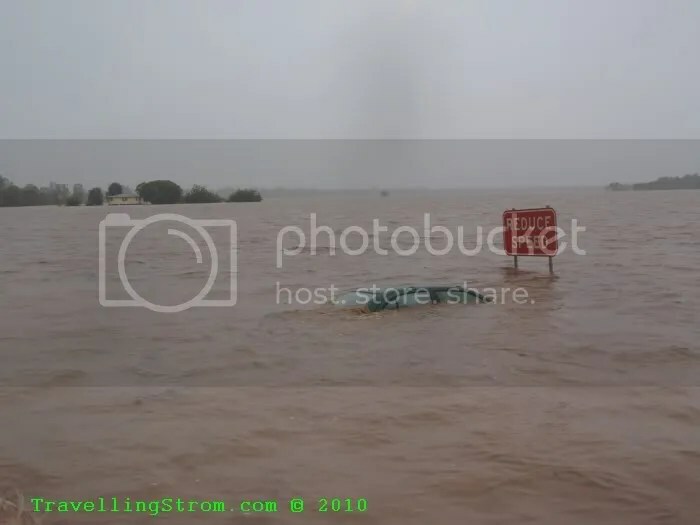 Once the lady was transferred to the evacuation center, it was back into the town itself because the word had come down from the top brass, evacuate the whole town, no one was allowed to stay because the fresh water supply had been compromised and there was a major risk of disease!!! Once we had done the required tasks, we found we could actually tie up quite near the evac centre on the main street which was becoming quite crowded, but the choppers were on hand, about 7 of them and they were rotating the people out to a nearby mining camp accommodation, which are quite comfortable. 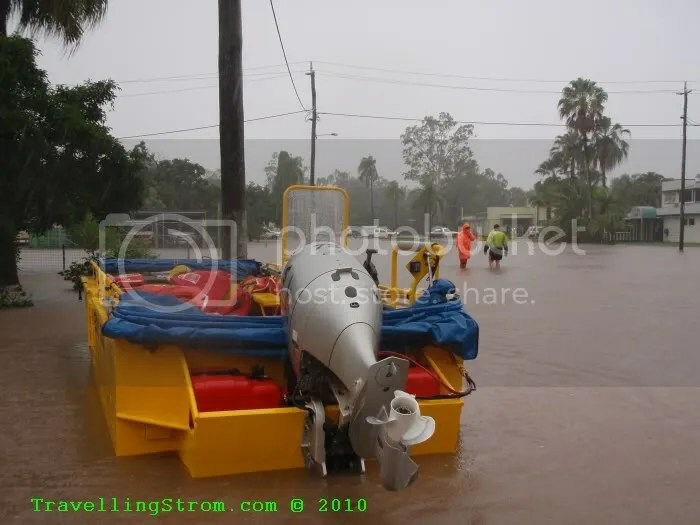 As the town was being cleared, we had been told to pack our gear and get ready to be choppered out, after the residents had all gone of course. 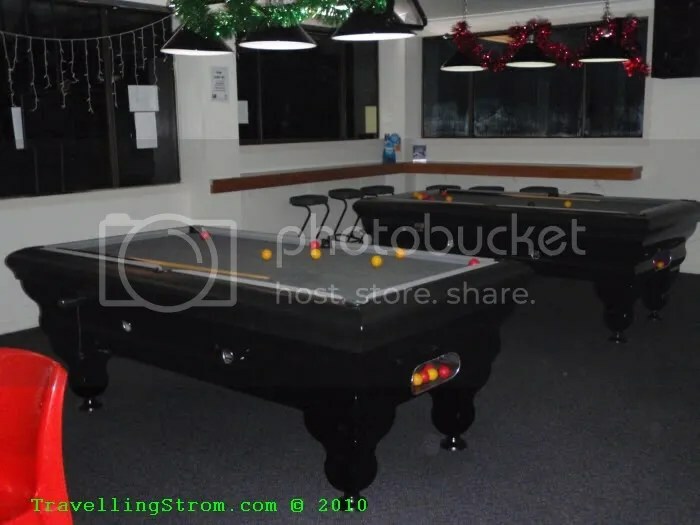 It was lucky we checked out, we did not expect our salubrious river views to be actually INSIDE the room!!!! But, after a fair bit of waiting, which we are quite used to, we found that we were staying another night as there is not enough daylight to get everyone out, that will be tomorrows job!!! 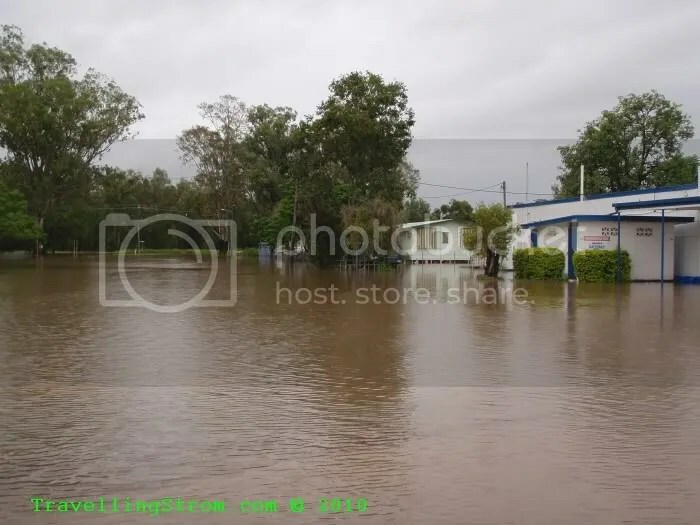 And as my camera battery had gone flat and having left my charger at home, so ends this photographic record for the time being, the next stage is the Rockhampton Floods. 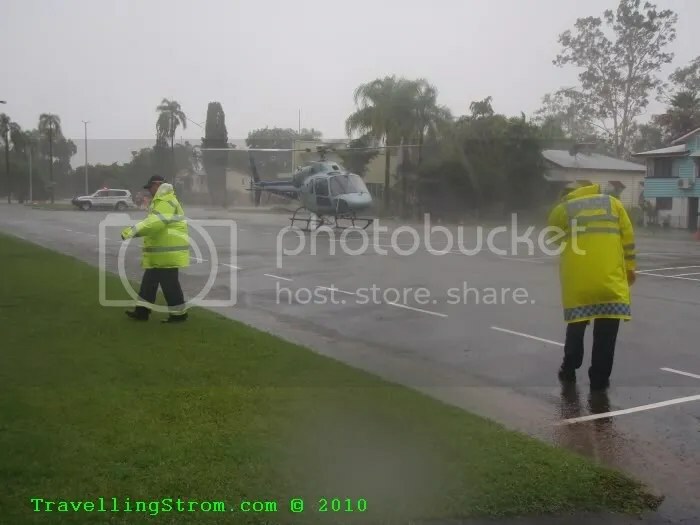 We left mid morning the next day and were choppered to Thangool airport, then driven from Biloela to Rocky by an SES member. Our local crew were busy and had not stopped while we were gone, so we headed home for some much needed R&R, I intended tonight to be my New Years Eve as I knew what was coming this weekend!!! 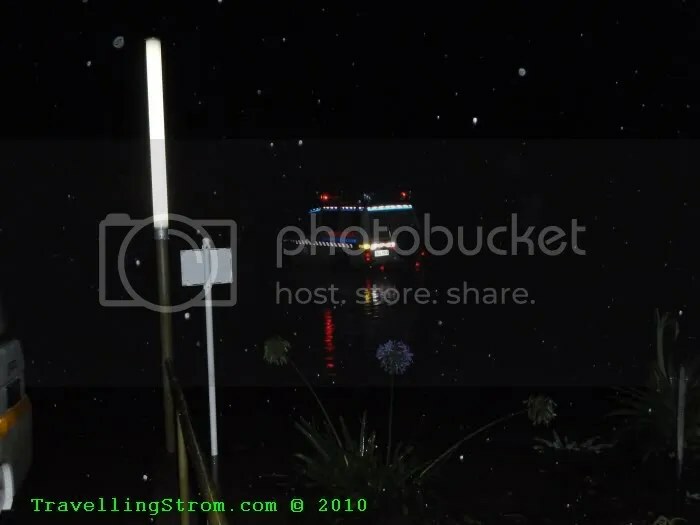 This entry was posted on January 2, 2011 at 16:19	and is filed under SES. 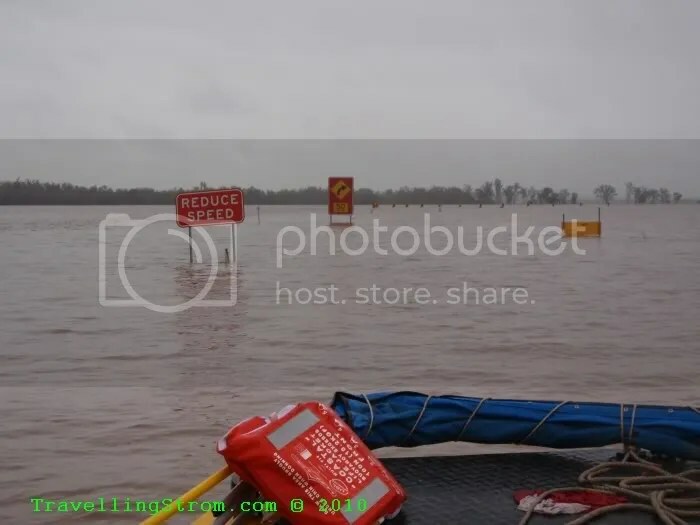 Tagged: Floods, Rockhampton, SES, Theodore. You can follow any responses to this entry through the RSS 2.0 feed. You can leave a response, or trackback from your own site. A belated Merry Christmas and Happy New Year to you. Was wondering the other night what you were up to and now I know. Not much different here. We did attend Vanessa & Tom’s wedding a while back. Very nice and the photography work kept me busy for the entire night. Take care of youself and stay dry. I could tell from the news that it was around you and you have outdone what we had here in 2009. Heya Richard, Glad to see you well and thriving. 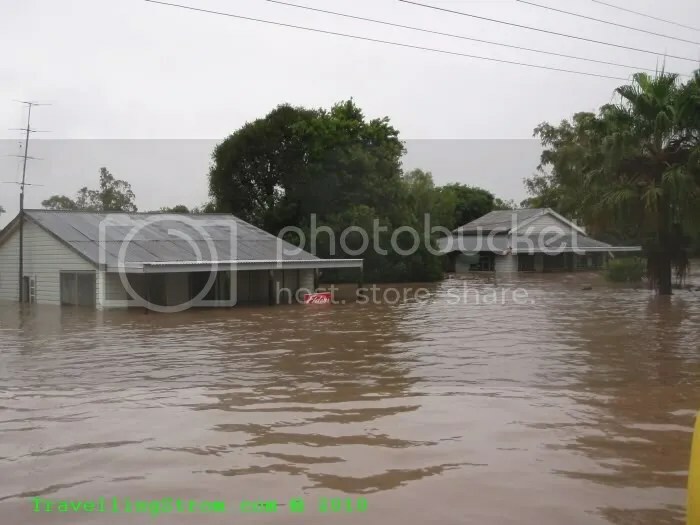 Massive rains there my friend. We have just ended a bit of a dry spell here in Arkansas. Nice to catch up to your going’s on. Merry Xmas and Happy New Year to you as well. 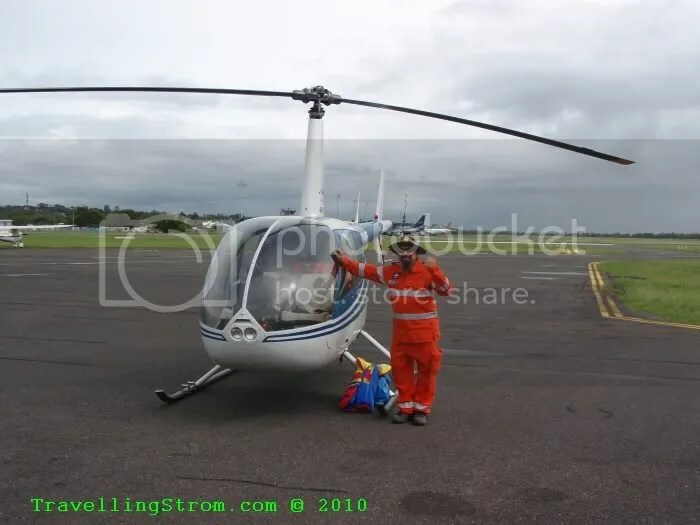 TravellingStrom to the rescue! Good job Richard, Have a great New Year! Thanks for the update TS. We’ve been wondering how you’ve been getting on. Stay safe, and we hope your place in Rocky is well above the high water mark. Never a dull moment Richard. I hope Rocky is surviving , and you are doing well. Morse code. Thought it might test your training. Its the same as the text. By the way you’ve made the national news up here too. Not yet, but I’ll send your blog onto the news services. Who knows, maybe you’ll become the local cub reporter too. 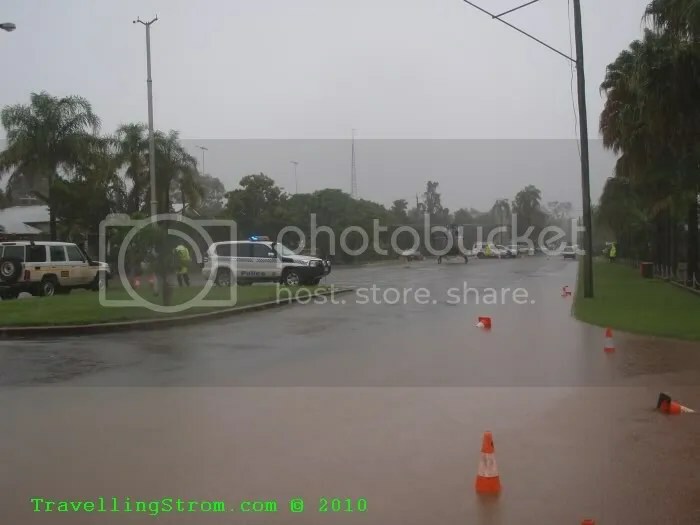 Today is Monday Jan 3rd and there was a large part of the BBC America morning news all about Rockhampton and the floods you are enduring. Reading your piece and looking at the photos you took makes it all the more realistic. It also goes ot show how large a continent Australia is since they aslo reported about the Ashes which is far from your mind at the moment. Look after your family first and report back when you can, make sure your bikes stay dry.I think you will remember for a long time New Year 2011. Hope all turns out well. The weather will change and life will go back to normal. Hang in there. I am from Theodore and living in France so this is great coverage …. 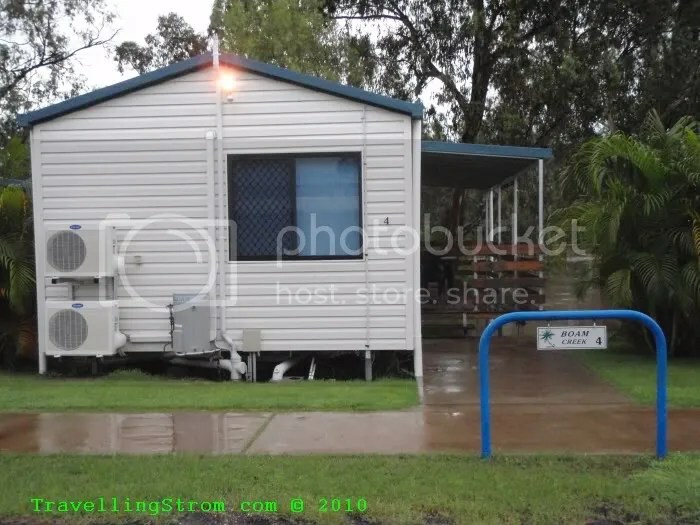 most residents got some but had flat battery problems too. 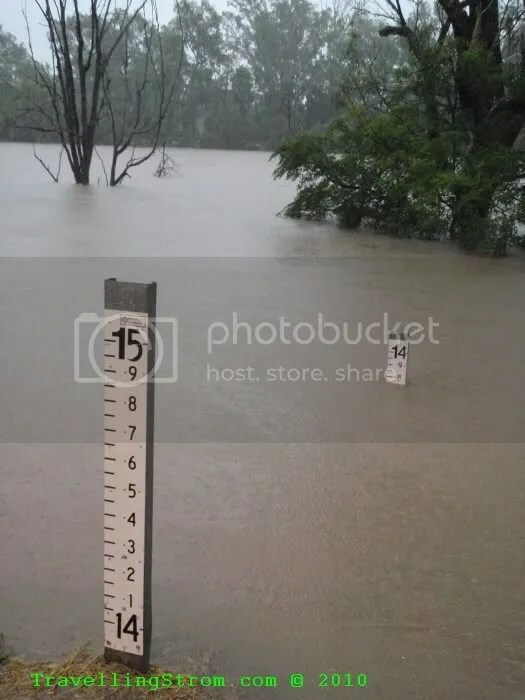 Love the dairy and flood height records. Well done of and good luck. 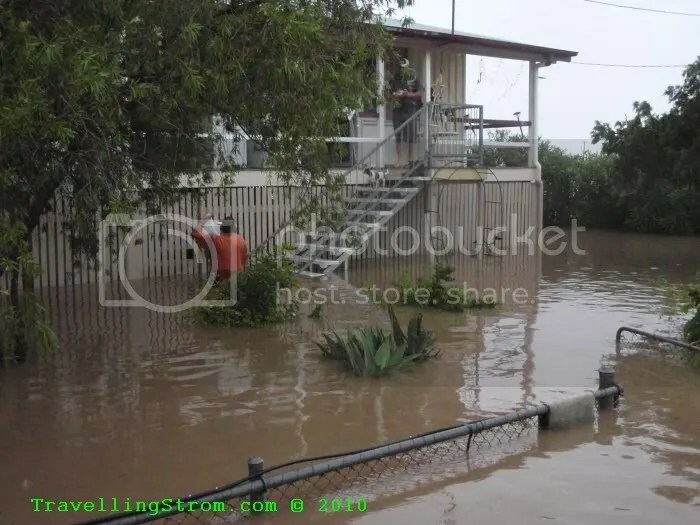 The rest of our family live in Emerald and Rockhampton – all swimming now.